US: DOD confirms eye injury to copter passenger; perhaps from Russian vessel Kapitan Man? | Laser Pointer Safety - News of aviation-related incidents, arrests, etc. The Department of Defense (DoD) recently completed its investigation of the suspected lasing incident of April 4, 1997 involving the Russian merchant vessel M/V Kapitan Man, in Puget Sound near Seattle, Wash. The incident involved the suspected lasing of a Canadian military helicopter -- that is, the illumination of the helicopter by a laser -- by the Russian merchant vessel, resulting in eye injuries to an American naval officer aboard that helicopter. The results of the investigation indicate that the eye injuries to the American officer are consistent with injuries that would be expected from exposure to a low level laser, such as a laser range-finder for example, but that there is no evidence to indicate the source of the laser. Specifically, the investigation could not link the officer's eye injury to a laser on the Kapitan Man or to any other location. On Friday, April 4, 1997, a United States Navy lieutenant sustained eye injuries that appeared to be consistent with exposure to a low level laser, such as a laser range finder. The injuries apparently were sustained while the lieutenant was aboard a Canadian military helicopter on routine maritime patrol over the Strait of Juan de Fuca north of Puget Sound near Seattle, Wash., conducting surveillance of merchant vessels, including the Russian merchant vessel Kapitan Man, in U.S. territorial waters. The Navy lieutenant was assigned as a liaison officer to the Canadian Maritime Pacific Command. That night, the lieutenant sought medical attention from a local civilian physician for eye pain. This initial exam indicated corneal abnormalities of an unknown origin. 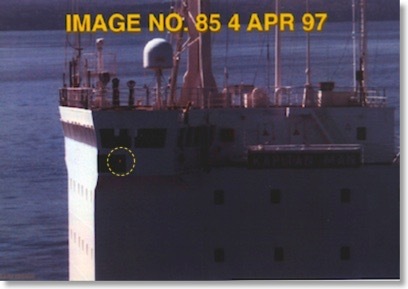 A photograph taken by the lieutenant during the surveillance of the Kapitan Man showed a red light below the port bridge, causing some to suspect a possible laser on board the Russian vessel had illuminated the Canadian helicopter. Based on this information, Washington decided on Monday, April 7, to detain the Kapitan Man. The detention of the merchant vessel reflected the determination of the Captain of the Port Puget Sound that the Kapitan Man was "suspected of having materials or conditions aboard which constitute[d] an unreasonable hazard." Under the order, the Kapitan Man was prohibited from moving or transferring any cargo "until the completion of a Coast Guard examination to verify that no hazardous condition exists aboard" the vessel. The State Department also notified the Russian Embassy in Washington of the decision to detain and search the Kapitan Man. The vessel was boarded at approximately 2040 [8:40 p.m.] (EST) by a team consisting of Coast Guard and Navy personnel. The purpose of the search was to locate any hazardous cargo on the vessel, including any laser device that could have been responsible for the lieutenant's eye injuries. The search took about two hours and yielded no safety problems, resulted in no laser equipment being found, and discovered no sign of any recent modifications to the ship that might have indicated, for example, the removal of a laser from the area below the port bridge where the red light had been imaged. Moreover, the Master of the Kapitan Man denied having any laser device on board, and only one crew member indicated he had ever received any laser-related training. The search team indicated that the crew of the merchant vessel did not intentionally deny them access to any area of the ship that they asked to see. Inspection of the port bridge area where the red light had been seen in the photograph revealed two deep red running lights, one mounted above the other, that met the guidelines established for sidelights. Following this search, Washington decided to let the vessel depart Port Puget Sound and to seek the cooperation of the Russian Embassy in evaluating the incident. The M/V Kapitan Man departed the Seattle area on April 8. Subsequent medical evaluations were conducted April 8-14 at the U.S. Army Medical Research Detachment at Brooks AFB, Texas, which specializes in laser injury and safety issues. Those evaluations drew the conclusion that there was a high probability that the minor burns on the lieutenant's right retina were caused by multiple laser exposures such as might result from a single glimpse at a repetitive pulsed laser. A later medical examination in mid-May did not change this diagnosis. Subsequent evaluation conducted by the Department of Defense included tests with lasers and the camera used by the lieutenant. The DoD evaluation of the photograph showing a red light on the port bridge indicated that the light was a port navigational running light. DoD tests were able to identify a candidate laser that could have created the type and pattern of retinal injury suffered by the lieutenant, but a photograph of this laser did not produce an image similar to that seen in the photograph of the Kapitan Man. Moreover, hand-held lasers generally do not have the pulse repetition rate necessary to explain the multiple exposures in a single glimpse that the medical examination hypothesized to have occurred. Those types of lasers would have required line of sight contact for tens of seconds, which would have been highly unlikely under the circumstances. Yet, the search of the Kapitan Man revealed no evidence of fixed lasers on the ship. Another type of laser that could have produced an image similar to that seen in the photograph, by contrast, would not have produced an eye injury like that seen in the lieutenant. Finally, tests involving deep red lights, such as the running lights observed on the ship, were able to duplicate the image seen in the photograph. The Department believes that the eye injury suffered by the American naval officer is consistent with injuries that would result from exposure to a repetitive pulsed laser. Available evidence does not indicate, however, what the source of such an exposure might have been. Specifically, there is no physical evidence tying the eye injury of the American officer to a laser located on the Russian merchant vessel. The Department is not closing this investigation. There will be additional medical examinations. The Department will analyze any new information that might become available to identify the source of the injury. From the August 2004 medical journal Archives of Ophthalmology (now called JAMA Ophthalmology), “Assessment of Alleged Retinal Laser Injuries”, Martin A. Mainster, PhD, MD; Bruce E. Stuck, MS; Jeremiah Brown, MD, MS. Note that for security reasons, the military nature of the incident was not disclosed in the description, but this is clearly the Kapitan Man case. A middle-aged photographer had pain from a corneal abrasion after taking photographs of a ship. He surmised that there had been a laser device on the ship and that a laser injury had caused his discomfort. His visual acuity was 20/20 OU after the episode. A retina specialist found 3 tiny (10- to 20-µm) RPE window defects in one eye on a fluorescein angiogram and ascribed them to laser injury. Findings from optical coherence tomography were normal. Amsler grid test results were highly variable, and the locations of grid abnormalities and RPE defects were inconsistent. During the next 5 years, the photographer developed chronic headaches, photophobia, blurred vision, and nighttime driving and reading difficulties. He reported episodes of monocular diplopia. He also reported a constellation of terrible, intermittently disabling, periodic, and chronic eye and face pains. The initial retina specialist ascribed all these symptoms to laser injury. He also diagnosed a laser exposure in one of the photographer's companions present at the incident who reported similar symptoms but had completely normal findings on retinal examination and fluorescein angiograms. A review of the photographer's voluminous medical history several years after the episode revealed dry eye syndrome, map-dot-fingerprint corneal dystrophy, temporomandibular joint syndrome, iritis, conjunctivitis, migratory arthritis, plantar fasciitis, chronic low back pain, epididymitis, and recurrent diarrhea. Most of the systemic problems predated the purported laser incident. New RPE defects developed after the incident. The photographer had not been diagnosed previously as having reactive arthritis (Reiter syndrome) which can produce small RPE defects. No evidence of laser injury was found in the years after the incident by 17 other ophthalmologists, including 5 neuro-ophthalmologists and 8 retina specialists. A trial was held 5 years after the incident in which the retina specialist who made the initial diagnosis steadfastly maintained that all the photographer's symptoms were due to retinal laser injury. A jury ruled against the photographer's claim for damages against the ship owner. No laser was ever identified in this case despite a search of the ship. A costly, time-consuming chain of events was precipitated by the initial retina specialist's (1) failure to attach significance to an association between the photographer's symptoms and his complex past medical history, (2) quick diagnosis of a laser injury, (3) subsequent attribution of the photographer's growing list of pains and visual complaints to a laser injury, and (4) diagnosis of laser exposure in the photographer's associate based on symptoms in the absence of retinal or angiographic abnormalities. As noted previously herein, the few tiny RPE defects on which the initial diagnosis was based are common. Even if these defects were due to threshold laser effects, they could not have caused the photographer's reported problems or millions of patients would be afflicted with similar problems after routine retinal laser surgery. The patient had real complaints, but they were caused by preexisting autoimmune problems rather than by laser injury.